Shipping can be a time consuming and sometimes confusing task. Filling out and printing labels, addressing packages and arranging for pickup and drop-off are just some of the tasks that can make the seemingly easy process of mailing a package a source of frustration. Add to that the costs of shipping services and something as simple as mailing can quickly become a major business expense. It’s worth looking into some cost savings and enhancements that can make the process more efficient and cost effective. You may be surprised at how much time & money you can save. One way that small businesses can gain those efficiencies and cost savings is by qualifying for Commercial Base shipping rates, and the best way to do that is by using IMpb barcodes. What follows is an overview of how an IMpb barcode works, answers to some common questions about the barcodes and how an IMpb barcode can benefit you as a small business. IMpb stands for “Intelligent Mail Package Barcode,” and it’s the most modern way of tracking parcels and additional services through the USPS. The IMpb barcode is used to track packages from pickup to the final delivery. The data provided by the IMpb barcode allows for a faster delivery, better tracking and reduced handling. It’s important to note that IMpb barcodes are not just for use with the USPS because UPS and FedEx both have shipping services that get routed through the USPS, too. Small business owners are sure to be interested in how to save on shipping costs, but they’re also likely to have several questions about the IMpb barcode. Here’s a list of some of the most common. Perhaps the biggest benefit of using an IMpb barcode is that your small business can take advantage of reduced commercial shipping rates. Plus, your business can better track packages from pickup to delivery, which will allow you to better predict the delivery time. Another advantage of using an IMpb barcode is that the USPS service is generally improved through more streamlined operations, and you receive automatic insurance. What type of package requires an IMpb? All commercial packages using CBP or CPP rates require an IMpb barcode on the shipping label, and it doesn’t matter what size, shape or price category the package falls under. This also applies to any flat-rate boxes or envelopes. When are IMpb barcodes not required? Periodicals and standard mail marketing (in the form of product samples), as long as they have a simplified address or detached address label, do not require an IMpb. What data is needed to support IMpb? A Shipping Services file (a file that is sent electronically to the USPS which contains all pertinent shipping information) that is a version 1.6 or higher. Any package that’s shipped commercially must submit mailing information electronically using a Shipping Services File. Each file contains the required details about the parcel, including piece-level details, mail class, processing category, mailer ID, payment account number, transaction ID and the method of payment. These files must be transmitted to the USPS at the end of the shipping day. A delivery address or zip + 4 code for each entry in the Shipping Services File. What are the physical requirements to generate an IMpb barcode? It is essential that a small business has the right equipment needed to generate barcodes. So just what is the right equipment? First, you’ll need the right software to generate and transmit the appropriate electronic information contained in the Shipping Services File for each package. Also, a quality printer capable of generating unique, high-quality IMpb barcodes for packages is an obvious must-have. The SendPro solution from Pitney Bowes has you covered on both of these fronts. The SendPro solution comes with integrated scales and printers. Both the scale and printer connect to your desktop via a USB port. The scale can accurately weigh items up to 10 pounds and the printer can create professional labels for each carrier. Pitney Bowes recommends getting a SendPro solution for each shipper in your office. Environments that ship packages larger than 10 pounds should look into the SendPro networked solution. This solution includes a scale that can weigh packages up to 70 pounds, and it also includes a durable printer. Every office environment is different, so it doesn’t matter if you need just one SendPro desktop kit or several, networked kits or any combination in between, the SendPro options allow you to create the shipping environment that makes the most efficient and affordable sense to your organization. Is IMpb required for meter users? All meter mailers (those using machines to weigh and print postage directly on their packages) must meet IMpb requirements in order to qualify for reduced commercial mailing rates. How can I qualify for Commercial Base shipping rates? The easiest way is to contact Pitney Bowes for a demo or 90-day free trial of their SendPro solution. The innovative software includes a single sending portal, which allows the user to easily determine the best sending choice for a specific project, print shipping labels, track items and control and manage expenses. Office shipping can be a time consuming and confusing task. Pitney Bowes has more than 80 years of experience in building mailing equipment and the software to run it. Find out how this experience can benefit your small business. 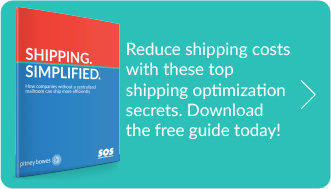 Learn how to save time AND reduce shipping expense with this free eBook: Shipping Simplified. You’ll see just how easy it can be to mail packages efficiently and effectively.